GB Decimal. Full Year Set; 1982.
gb stamps presentation pack 163,royal mail 350 years of service,1985..
GB 1975 Royal Mail stamps Collectors pack. Year. VGC. Free postage!! 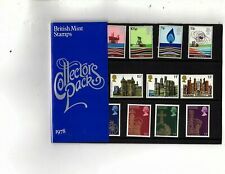 GB 1968 Collectors Stamps Blue Presentation Year Pack VGC Free Postage!! 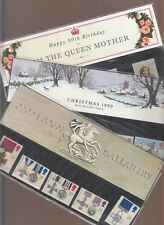 Royal Mail Presentation Pack "Autumn" Mint GB Stamps Year 1993. Dispatched with Royal Mail 1st Class Letter. GB 1973 100 Years County Cricket Souvenir Presentation Pack Stamps Free postage! Complete with plastic wrapper and in excellent condition. Royal Mail presentation pack mint stamps "Enid Blyton" from 1997 pack number 280 Presentation packs I have listed come from a collection that my brother had. These packs have been stored away in a loft for a good number of years. All packs are above 20 years old so the plastic cover and cardboard wallet might reflect this, the stamps are in mint condition. Please take this to mind if purchasing. I have other Royal Mail presentation packs listed if you would like to take a look. I am happy to leave feedback once positive feedback has been received, any problems can be sorted via message. Thank you for looking. GB Presentation Pack. International Year Of The Disabled People1981. Pack No.125. Dispatched with Royal Mail 2nd Class Letter. Royal Mail presentation pack mint stamps "Christmas Crackers 1997" from 1997 pack number 282 Presentation packs I have listed come from a collection that my brother had. These packs have been stored away in a loft for a good number of years. All packs are above 20 years old so the plastic cover and cardboard wallet might reflect this, the stamps are in mint condition. Please take this to mind if purchasing. 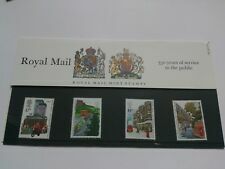 I have other Royal Mail presentation packs listed if you would like to take a look. I am happy to leave feedback once positive feedback has been received, any problems can be sorted via message. Thank you for looking. Royal Mail presentation pack mint stamps "Olympics & Paralympics 1996" from 1996 pack number 268 Presentation packs I have listed come from a collection that my brother had. These packs have been stored away in a loft for a good number of years. All packs are above 20 years old so the plastic cover and cardboard wallet might reflect this, the stamps are in mint condition. Please take this to mind if purchasing. I have other Royal Mail presentation packs listed if you would like to take a look. I am happy to leave feedback once positive feedback has been received, any problems can be sorted via message. Thank you for looking. Royal Mail presentation pack mint stamps "Postcards" from 1994 pack number 246 Presentation packs I have listed come from a collection that my brother had. These packs have been stored away in a loft for a good number of years. All packs are above 20 years old so the plastic cover and cardboard wallet might reflect this, the stamps are in mint condition. Please take this to mind if purchasing. I have other Royal Mail presentation packs listed if you would like to take a look. I am happy to leave feedback once positive feedback has been received, any problems can be sorted via message. Thank you for looking. Royal Mail presentation pack mint stamps "Christmas 1994" from 1994 pack number 252 Presentation packs I have listed come from a collection that my brother had. These packs have been stored away in a loft for a good number of years. All packs are above 20 years old so the plastic cover and cardboard wallet might reflect this, the stamps are in mint condition. Please take this to mind if purchasing. I have other Royal Mail presentation packs listed if you would like to take a look. I am happy to leave feedback once positive feedback has been received, any problems can be sorted via message. Thank you for looking. Rest of the World - £5.15. 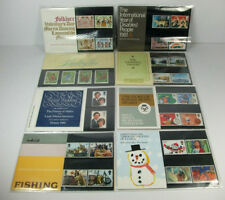 GB 1978 Royal Mail stamps Collectors pack. Year. VGC. Free postage!! Royal Mail presentation pack mint stamps "St. Augustine & St. Columba" from 1997 pack number 275 Presentation packs I have listed come from a collection that my brother had. These packs have been stored away in a loft for a good number of years. All packs are above 20 years old so the plastic cover and cardboard wallet might reflect this, the stamps are in mint condition. Please take this to mind if purchasing. I have other Royal Mail presentation packs listed if you would like to take a look. I am happy to leave feedback once positive feedback has been received, any problems can be sorted via message. Thank you for looking. Royal Mail Presentation Pack "Cinema Celebration" Mint GB Stamps Year 1996. Dispatched with Royal Mail 1st Class Letter. Royal Mail presentation pack mint stamps "Summertime" from 1994 pack number 250 Presentation packs I have listed come from a collection that my brother had. These packs have been stored away in a loft for a good number of years. All packs are above 20 years old so the plastic cover and cardboard wallet might reflect this, the stamps are in mint condition. Please take this to mind if purchasing. I have other Royal Mail presentation packs listed if you would like to take a look. I am happy to leave feedback once positive feedback has been received, any problems can be sorted via message. Thank you for looking. Royal Mail presentation pack mint stamps "Communications" from 1995 pack number 260 Presentation packs I have listed come from a collection that my brother had. These packs have been stored away in a loft for a good number of years. All packs are above 20 years old so the plastic cover and cardboard wallet might reflect this, the stamps are in mint condition. Please take this to mind if purchasing. I have other Royal Mail presentation packs listed if you would like to take a look. I am happy to leave feedback once positive feedback has been received, any problems can be sorted via message. Thank you for looking. 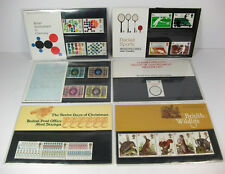 GB 1980 Royal Mail stamps Collectors pack. Year. VGC. Free postage! !